Due to the May 1st bank holiday, AbeBooks European offices will be closed for the day tomorrow - Thursday 1st May. Normal Customer Services will resume on Friday May 2nd. Please review our Online Help Pages - you may be able to find the answer to your query there in the meantime. As you may know, in early April Royal Mail increased their postage rates. You may need to look at adjusting your shipping matrix to ensure that your rates and speeds best reflect the services you offer. How can I edit my shipping rates and speeds? Buyers appreciate that they can find any book from AbeBooks booksellers, and the list of most expensive books sold on AbeBooks (all sites) during March once again shows how vast your selection is! Charles Wittingham of Chiswick Press published this edition of Euclid’s works on Euclidean geometry in 1847. Written and designed to simplify Euclid's propositions, this remarkable example of Victorian printing has been described as one of the oddest and most beautiful books of the century. Containing many of Eliot’s canonical works including “The Love Song of J. Alfred Prufrock,” “The Hollow Men,” and “The Waste Land,” this is a first edition, one of 85 numbered copies signed by Eliot. First edition of Lewis's earliest and rarest works from 1938. Account of one of the world’s first modern suspension bridges linking mainland Wales with the island of Anglesey. A 1828 first edition elephant folio printed in London with 17 engraved plates. A collection of 60 volumes of the International Journal of Anthropology and Linguistics. Articles are in French, German, and English covering all topics of the discipline. Gmelins Handbook of Inorganic Chemistry, a virtually complete set of 372 volumes published between 1926-1984. Click here to review the Top 10 Bestsellers in March 2008. AbeBooks is greatly honoured by its nomination for the Which? Award 2008 - Best Online Retailer. This is not just a credit to AbeBooks, but to all our Member Booksellers as well. The diversity of inventory you offer along with the services you provide help AbeBooks to stand out from other online marketplaces. The results will be announced in June 2008 at The British Museum in London. Not enough that we were nominated for this award, AbeBooks.co.uk Customer Service team also came out top along with Play.com in a Customer Service Satisfaction Survey performed by consumer body Which? Online in March this year. The AbeBooks.co.uk Customer Service Team, scored a fantastic 89% for overall satisfaction, whilst the website was praised for the ease with which one can find books. How do AbeBooks Use Your Money? AbeBooks invests a lot of time and capital into marketing the AbeBooks websites, to make sure that we can continue to bring new buyers to the AbeBooks websites, and also keep encouraging existing buyers to come back and buy more of your books. There are several ways in which we do that, we would like to introduce you to some of those, so that you can see what we are doing with your money. Search Engine Marketing - have you ever "Googled" second hand or out of print books? AbeBooks are the top of the search results for these terms. There are many keywords that we can bid money on to make sure that AbeBooks is at the top of the those buyer searches. We are also in the process of incorporating the AbeBooks inventory into the Google search database so that your books can be found there directly too. Affiliate partners - several thousand affiliate partners help to spread the word and direct traffic to the AbeBooks websites. They incorporate AbeBooks banners or even integrate search boxes to direct buyers to AbeBooks, when they do not have a particular book in their own inventory. Coupons - We have started testing this in North America with very targeted marketing to specific buyer groups. These coupons are funded by AbeBooks. Newsletter Central - Avid Reader, Textbook Reader etc. newsletters are specifically targeted at different buyer groups, promoting bookseller titles, or specific books along with the links to those sellers offering those titles on AbeBooks. Re-activating buyers who have placed items in the shopping basket, but never checked-out. First time buyers; activating buyers who have an account, but have not yet made any purchases. Did you know that entering the incorrect order processing and refunds and returns codes could negatively affect your Bookseller Rating unnecassarily? We wanted to give you some tips to help you ensure that you are making the best of your Bookseller Ratings. Never let an order expire. Orders should be processed within 4 days otherwise they will expire. Remember to check your sales online in your account to ensure that you have not missed any if emails have not been received. Orders will be updated to "Availability confirmed" after 4 days if not processed. For those orders where you have been unable to secure payment please do not reject the order - mark it as "Incomplete Sale". NOTE: Always be careful to chose the correct reason when cancelling an order - it may make the difference to your Bookseller Rating and also what type of a refund a buyer will receive. For more information on order processing review our Online Help Pages. 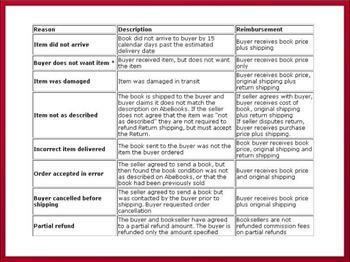 Make sure that you are up-to-date on what the correct reason codes to ensure that you not only refund the correct amount, but also do not unnecessarily reduce your bookseller rating. If you have not received a returned item, you should report a missing shipment to avoid the buyer being refunded until such times as the book has been returned, or a tracking number has been provided. Review the chart below to see what will be refunded when using what refund reason. Or for more information on processing Refunds and Returns, visit our Online Help Pages. As announced at the beginning of the month, we will be introducing a new pricing model effective 28th April 2008. A new, amended AbeBooks Agreement dated 28th April 2008 will automatically replace the current AbeBooks Agreement dated 3rd April 2006. The changes include revisions to the AbeBooks Program Guide and Fee Schedules. For an overview of the pricing model changes, please click here. To read the original announcement of the pricing model changes in £GBP, please click here. To read the original announcement of the pricing model changes in €EUR, please click here. It is not necessary to sign the new Agreement; it will automatically apply to all current AbeBooks booksellers who continue to list their books with AbeBooks after the 28th April 2008. If you have any questions, please refer to our FAQ page and feel free to contact our Customer Service Team. They can help explain how these changes will impact you. 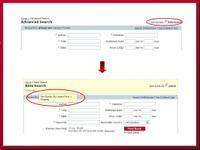 Do not forget to check out the beta version of our new search refinement, available through the Advanced Search page. This search refinement allows buyers to sort results by lowest price + shipping, something both buyers and sellers have been asking for. This is an addition to - and will not replace - any existing refinements. It will be beta tested extensively before launch. AbeBooks is a global online marketplace for books with millions of new, used, rare, and out-of-print books listed for sale by thousands of independent booksellers around the world. Should you have any questions to any aspect of your AbeBooks bookseller account, please visit our online help pages.